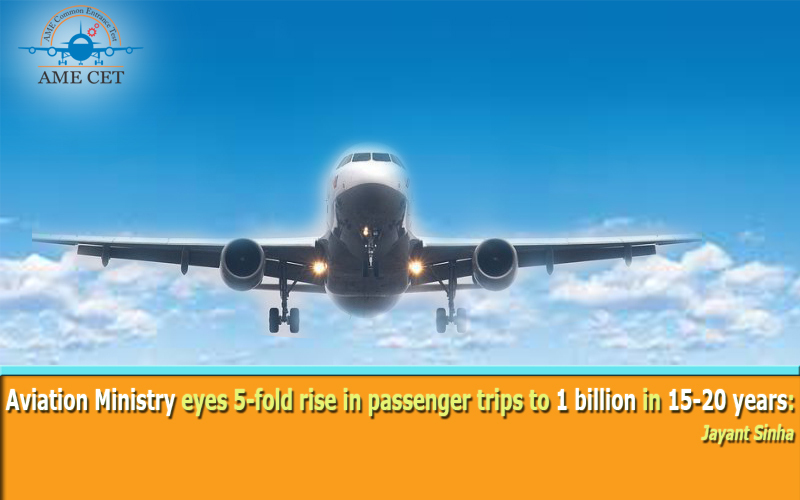 The aviation ministry is targeting a five-fold increase in passenger trips to one billion per annum in 15-20 years in view of the huge growth opportunities the sector holds, Union Minister Jayant Sinha said today. The Minister of State for Civil Aviation said that the government is working on steps such as developing new Greenfield airports and skilling manpower to achieve this target, We are giving open invitation to Airline companies to invest in Indian market. This will ultimately increase the job opportunities to the Indians in the field of Aircraft Maintenance engineering, Airmen, cabin crew, Pilots etc. “A target of billion passenger trips in the next 15 to 20 yrs is very realizable and is in fact a realistic target that we should be looking for,” he said here at the AIMA event. He also said that the billion passenger trips would not come from aircraft alone but also from helicopters, sea planes and passenger drones. Many of these have still to be manufactured in the country and it provides tremendous business opportunities to start and develop these new technologies, he said. Elaborating on passenger drones, Sinha said this is a big industry and in the coming years, it is likely to touch a trillion dollar mark. “We in India have the opportunity to be a leader in this. We are already working on drone regulations so we can set standards, develop different drone technologies,” he said. “Like we have made air travel affordable to common people wearing ‘Hawai Chappals, similarly we can go from auto rickshaws to air rickshaws, that are the opportunity,” he added. Further the minister said that the billion passenger trips would open tremendous opportunities for growth and investments for businesses. “In 2013, the the total number of passenger trips was about 100 million. In 2017, we are going to get close to 200 million passenger trips,” he said, adding that the total revenues of the airline industry last year was is close to Rs 2 lakh crore. Indian railways and the telecom sector also have same level of revenues each, he said. He said that today only 5 per cent of the 1.3 billion Indians travel by air. Sinha said that this target would throw some major challenges and the government is working on it. Safety and security is the number one concern and the ministry is working hard on this, he said, adding that for security “we are working on a unified security architecture with CISF” to ensure that all large or small airports have same level of high security. To ensure safety of passengers, the ministry is investing spending on flight inspectors, air traffic controllers and Aircraft Maintenance Engineers. These growth is depend on technical hands who can do it possible, Aircraft Maintenance Engineers are responsible to provide safety, security and maintenance of an aircraft, they are the backbone of the aviation industry. “This will quintuple. So we will have 6 million people working over the next few years,” he said. These show the good career in Indian Aviaiton industry as Aircraft Maintenance Engineer, Pilot, Crew Members, Air Traffic Controller etc. He said land to build new greenfield airports is also a challenge. New airports are coming up in Navi Mumbai, Goa, Pune and Jewar in western Uttar Pradesh. “We think to get one billion passenger trips, we have to invest Rs 4 lakh crore. That is what experts are saying,” he said. On the job front, he said about 2 lakh people are directly employed in the aviation industry and indirectly about 1.2 million in various fields like cabin crew members, airmen, flight inspectors, aircraft maintenance engineer , pilots etc. that before. So great to discover another person with a few original thoughts on this subject. By the end in the create period, all water haas become taken off the spin basket as well as the outer tub. on the top from the carton said it was great for two more weeks. my pal who was within the hospital. Open the Cooking Fever app day-after-day. We’re not working this electronic mail: @ as a result of the Worldwide Lending Affiliation stated all lenders with a free e mail ID should upgrade to personalized e mail deal with.